It started off as just something fun. A way for a 9-year-old girl with a rare lung disease and who is home schooled to meet a mix of new people. It turned out to be all that, and much more. 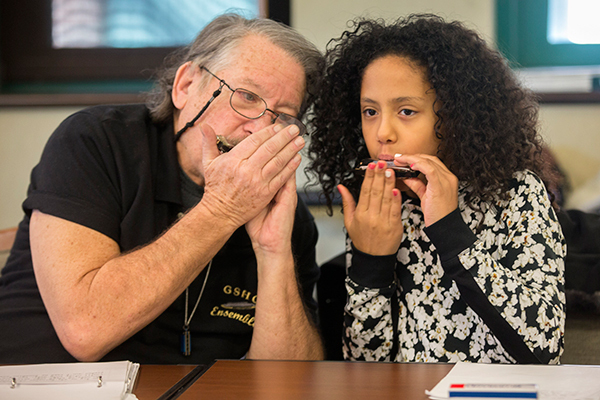 Chloe Fernandez believes that participating in Harmonicare, a free class where anyone with a lung disease is welcome to learn how to play the harmonica, has led to fewer hospital visits and sleepless nights, as well as overall better breathing. She and her mother, Leslie Mota, say the sessions, held once a week at Holy Name Medical Center, have produced long-reaching health benefits. Chloe has chronic obstructive pulmonary disease (COPD) and primary ciliary dyskinesia (PCD), a rare genetic disorder that affects her cilia, the tiny structures that line the airways. Without properly functioning cilia, she is unable to protect her respiratory system and can experience breathing difficulties and frequent lung infections of the lungs. When Chloe goes into respiratory distress, the Ridgewood youngster needs a nebulizer, which administers medicine to help open her airways. She was using it several times in a 24-hour period. But it's not always effective. "I would be sleeping and all of a sudden wake up because I couldn't breathe," Chloe said. "It's the worst feeling in the world – especially when the nebulizer doesn't work." Chloe was often hospitalized for weeks at a stretch until her oxygen levels could be elevated or an infection treated. During times of respiratory distress, Leslie said normally chatty Chloe grows quiet and then her chest heaves as she struggles for air. Sometimes the wheezing is so violent, it induces vomiting. But since starting Harmonicare 14 months ago, Chloe, now 10, has only been hospitalized once and uses the nebulizer much less frequently. She doesn't gasp for air nearly as often and coughs more, which helps keep her lungs clear. Both Chloe and Leslie believe her improved health is a direct result of Chloe attending the class as well as her constant practicing. Holy Name's Harmonicare program is open to people with lung disease, whether they receive treatment at the medical center or in another hospital. It is taught by a volunteer musician who plays the harmonica regularly and welcomes people of all ages. Participants are encouraged to practice in between classes. "She plays all day – at home, in the car – whenever she can," Leslie said. "I think that's what is helping her so much." Playing a harmonica hasn't been scientifically proven to help people with lung disease but exercises that force patients to breathe in and out are part of standard care. The simple harmonica, cheap and easy to play, is the only instrument with this function. "A harmonica is the only instrument that makes music when you blow in and out, said Karine Shnorhokian, nurse manager and program director for Harmonicare. "Similar to how we breathe, using the harmonica not only exercises our lungs and diaphragm, but is a lot of fun too." Most of the people who attend Harmonicare are older than Chloe. But not only have members of the class formed bonds with each other, they have taken kindly to the spirited youngster. "I feel like they are my grandparents," Chloe said. "The class is so much fun, and I know it is definitely helping me. I love it." For information on the Harmonicare program at Holy Name, visit holyname.org/harmonicare/ or call 201-379-5660. For more information about Chloe, visit her website http://pcdhasnothingonme.com.